Blue topaz is the birthstone for December. The word topaz is derived from the Latin word 'Topazes', the ancient name of St. John's Island in the Red Sea. Blue topaz is also the state gemstone for Texas. 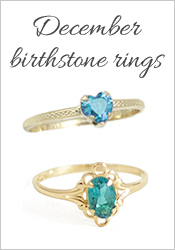 Typically a pale stone, blue topaz is usually heat treated to produce a darker blue. 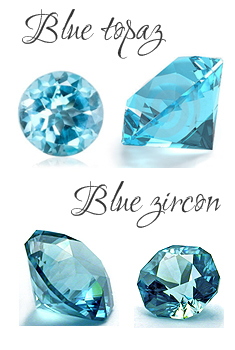 Blue zircon is a traditional birthstone for December. Blue zircons are also generally heat treated to produce more vibrant colors. Zircons are genuine gemstones and not related to the man-made cubic zirconia. Blue zircons have a deeper, bluish-green color. Zircons are one of the heaviest gemstones; so a blue zircon will weigh more than another gemstone of the same size. The Gingham Grasshopper offers baby bracelets with genuine birthstones. 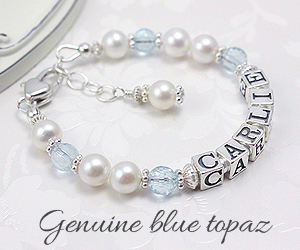 We have a variety of styles to choose from including name bracelets and engraved bracelets with pearls and birthstones. We also offer a wide range of birthstone rings in sizes to fit babies, toddlers and children, plus teens and adult birthstone rings. Turquoise is also a traditional birthstone for December and the 11th anniversary gemstone. Turquoise is a soft stone, just slightly harder than window glass. It is found only in a few places on earth; dry and barren regions. Turquoise is colored by copper which creates vivid blues and greens. It is the symbol of friendship. 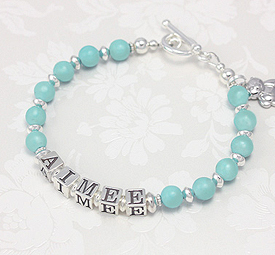 The Gingham Grasshopper offers a mothers name bracelet in a beautiful blue turquoise from Mexico. This turquoise is a soft sky-blue with very little matrix. Our jewelry for babies, children, and mothers is available in a wide variety of beautiful choices for December birthdays. These are all lovely shades of blue and quality gemstones.